The hottest snack of the moment, these convenient, portable, creations have been devised to provide a boost of energy at much-needed times of the day and to suit different dietary requirements. There are recipes suited to pre- and post-workouts, ideas for morning re-fuelling snacks and lunchboxes, plus creations to lift flagging energy levels during an afternoon lull and after school—there are even after-dinner treats. The book includes recipes to repair tired muscles after a bout of exercise with protein-rich balls or there are bites based on slow-release, unrefined carbs that will provide long-term energy. Opening with information on Energy Boosters nutritional health writer Nicola Graimes focuses on key, energy-supporting ingredients, including nuts, seeds, protein and superfood powders, unrefined slow-release carbs, fruits and vegetables. Alongside a brief explanation of each ingredient, there are details on key nutrients. 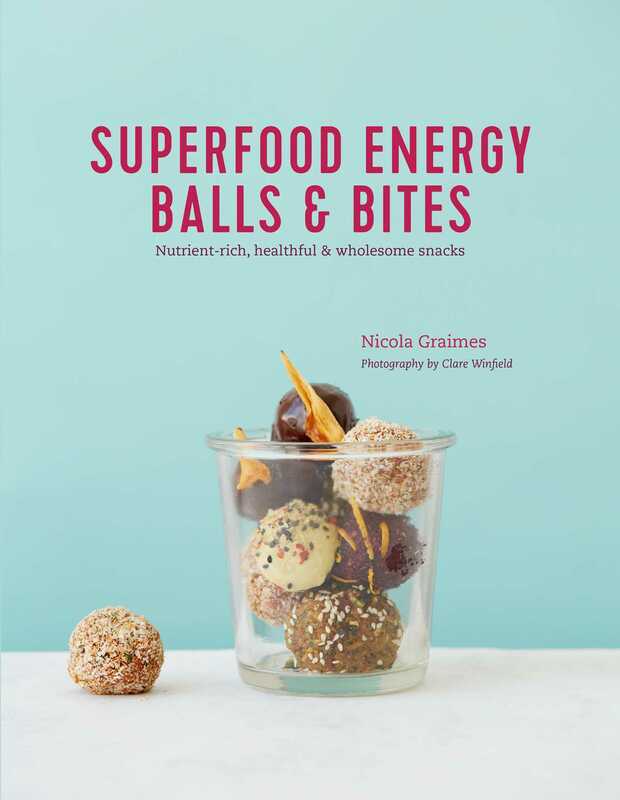 The book is divided into the following chapters: Raw Energy Balls and Bars, Cooked Energy Balls and Bars, Savory Energy Balls and Bars, Superfood Bites and, finally, Superfood Treats. All the recipes are dairy- and gluten-free and vegetarian, and many are vegan. Each recipe is easy-to-make, nutrient-rich, and prepared with wholesome ingredients.